Passover is almost here, but before I start sharing my growing stash of Pesach recipes, I need to talk about these spiced cauliflower muffins I became slightly obsessed with last month. I’d been looking for something interesting to bring to the Tot Shabbat potluck, and since Lilli was the cover girl in the article in the local paper about the program, I felt like I needed to bring it. This recipe taps into two hot food trends right now: cauliflower and turmeric. It seems 2016 was the year of the cauliflower, with recipes for its meaty “steaks” and cauliflower flatbreads. (More to come on those). But it was also the year of turmeric. I admit to being a little late to this one. My Aunt Bev brought my mom an enormous stash from her recent trip to Israel. She talked all about its healing properties, all of which I was completely unaware of. My only associations with turmeric up to that point had been stained clothes from Indian food. But then I started seeing recipes calling for it all over, and then the inevitable backlash as the wave crested. Sigh. I made this recipe the very day I clipped it. It’s by the Israeli couple Sarit Packer and Itamar Srulovich, who helped Yotam Ottolenghi grow his empire and now run the bakery Honey & Co. in London. Their second cookbook Golden: Sweet and Savory Delights from the Ovens of London’s Honey & Co. reminded me that I have a sweet spot for Israeli-run bakeries, be it the Tatte empire in Boston, or Breads in New York City. The recipes, like the shops, are a mix of savory and sweet, with flavor touches like tahini and cardamom that I love. This recipe is dead simple; no heavy equipment needed. Although the recipe calls for six enormous “trees” for six muffins, I used small florets and ended up with many more. The first time I baked these I used a mini muffin pan, and the batter was the perfect amount for all 24. I had more steamed cauliflower left after that batch, so I made a second round in regular-sized tins. That made nine perfect regularly-sized muffins. I ground the cumin and coriander seeds together in a spice grinder I picked up for $15 at Ocean State Job Lot a decade ago. I have the white pepper in the house specifically for hot and sour soup, so I was happy to finally have another use for it. I have seen turmeric everywhere from “international” stores, Whole Foods, and even Target. I have yet to find my pumpkin seeds since we moved, so I skipped them. The muffins were great without. The muffin is this wonderful mix of warm spice and sweet, and then there’s the soft bite of cauliflower. I stored these in a plastic container on the counter but I have no idea how long they are good for because they fly pretty quickly when they’re around. Spiced Cauliflower Muffins from Golden: Sweet and Savory Baked Delights from the Ovens of London’s Honey & Co. by Itamar Srulovich & Sarit Packer. 1) Break the cauliflower into florets, making sure there are at least six large “trees.” (You will most likely have more than six; cook them all and save the unused florets to eat another time or use them for more muffins.) Put the water and salt in a large pan and boil the cauliflower in it until soft (this will take 5–10 minutes). Check to see whether it is done by inserting a knife tip into the stem; it should penetrate without resistance. Drain well and set side. 2) Preheat the oven to 375°F/350°F convection and butter six muffin molds. Mix all the dry ingredients for the batter together. Add the eggs and use a spoon or spatula to mix until combined, then slowly mix in the melted butter and fold until it has all been incorporated. 3) Place a spoonful of batter in the center of each mold and stand a whole floret stem-down in each. Cover with batter to fill the molds to the top. Mix the pumpkin seeds and cheese, if using, sprinkle on the muffins and bake for 15 minutes. Remove from the tin and eat while still warm — they are best this way. We’re raising the girls Jewish. It was non-negotiable for me, and Rich was fine with it. This means we have Shabbat dinner every Friday night, attend services most Saturday mornings, and celebrate all sorts of holidays no one’s ever heard of. Rich did ask we celebrate two of his holidays – Christmas and Halloween – and given how much he’s agreed to do, it seemed like a fair bargain. This mixing of traditions has had some funny side-effects. For instance, earlier this year I had to explain to Lilli that, no, we do not open the door for Elijah the Prophet on Passover because he’s trick-or-treating. It also means my almost three-year-old thinks Santa is magic. I was actually a little taken aback by this one, and I suspect she learned about it from Connor at daycare. It certainly wasn’t from Aziz, whose mother wears a hijab. It’s hard to explain Christmas to someone who didn’t grow up with it. The outpouring of generosity and thoughtfulness is incredible; I’ll probably never fully get used to all the gifts that come with the holiday. Even though Lilli received something for every night of Chanukah, each candle in the menorah just meant we were one day closer to Christmas. This year Christmas fell on a Friday, and we all gathered on Christmas Eve morning at Rich’s brother’s home for a festive breakfast and gift exchange. The presents we all received were amazing, although I did start to break out in a sweat as I stared at the four massive bags of treasures that I somehow had to find a place for in our 1117 square-foot condo. For Christmas on Friday, we marked the holiday the way my people do – Chinese food and a movie. Rich and my tradition is to watch Badder Santa – the Bad Santa director’s cut – to mark the holiday. I also borrowed Die Hard from the library, something I’d never seen before. It was great, in case you were wondering. For Christmas/Shabbat dinner we made a Chinese banquet: veggie potstickers, scallion pancakes, green beans and Chinese eggplant. 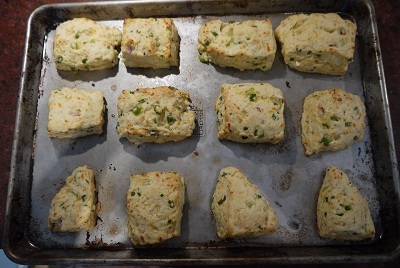 The scallion pancakes have become a bit of a holiday tradition for us. It’s from Joanne Chang’s flour, too, although we saw her make them on local public television cooking show a few years ago and took it from there. The recipe yields three pancakes, which was far more than we needed for our guest, Eric, and us. You can use Chang’s focaccia recipe, which is the same as her pizza dough, which I owe you guys because that’s become our recipe and it’s a great one. But you can also use store-bought pizza dough to make it easier on yourself. That’s what we did this year. Mind you, there’s still a bit of work: The dough has to rise, and there’s the frying, of course. Even if you don’t end up using the pancake recipe, bookmark the dipping sauce recipe. It’s a keeper. Line the baking sheet with a double layer of paper towels. Set aside. On a generously floured work surface, press each coil into a flat circle, deflating any air pockets and squishing the scallions gently into the dough. With the rolling pin, slowly and carefully roll out each flattened circle into a 10-in/25-cm round. Flour the dough and work surface as needed to prevent the dough from sticking. 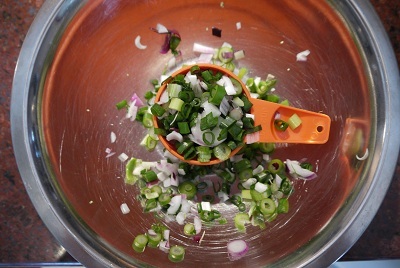 (It’s okay if some of the scallion mixture comes out.) As you finish rolling each round, set it aside. In a large skillet, heat the vegetable oil over medium-high heat until it is shimmering. To check if the oil is ready, sprinkle a bit of flour into the skillet. If it sizzles on contact, the oil is ready. Carefully add one pancake to the hot oil and fry, turning once, for 1 to 2 minute per side, or until golden. Transfer the pancake to the prepared baking sheet. Repeat with the remaining pancakes, always allowing the oil to return to temperature before adding the next one. Cut the pancakes into quarters, arrange on a platter, and serve hot with the dipping sauce. I don’t know about your market, but around here, mangoes have been on sale for the past few weeks. A good sale on fruit is something I can’t just walk by – note the four pints of raspberries currently resting on the second shelf of my fridge – so on-sale mangoes always make their way into my cart. The last time I was in the market, I bought five mangoes. As soon as they ripened, I ate one and used two of them to make this fresh mango bread from Dorie Greenspan’s Baking. I brought this bread to Western Mass for a visit with my parents. (I also brought this double chocolate banana bread, which was a hit.) 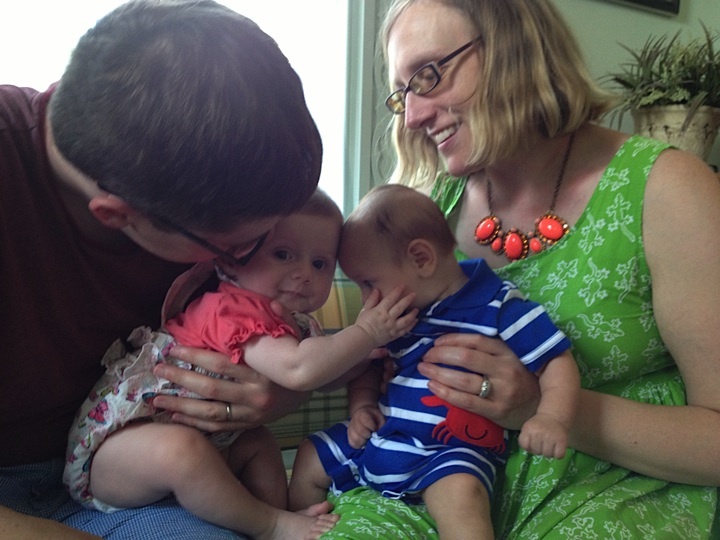 My sister-in-law had her 10-year Smith reunion at the same time, so Sylvie and Leo came up for a visit as well. 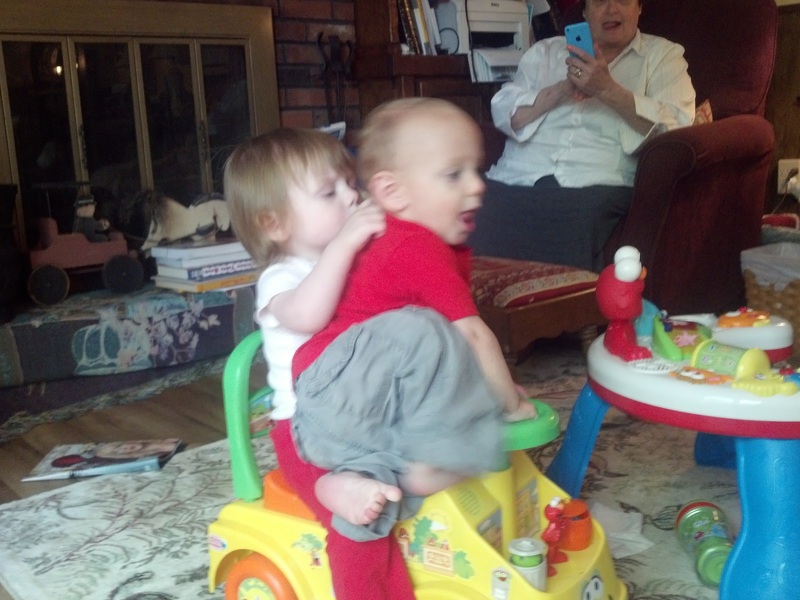 Leo and Lilli had Cousin Time, where Leo’s diminutive size did not stop him getting whatever toy he wanted — even if Lilli was using it. The bread was a big hit, so much so that there was none left for Rich, who was away for the weekend at a conference. Because I’d promised him some, I zipped home that Sunday and made the bread a second time with the remaining two mangoes. Yes, that’s right, I baked this bread twice in a four-day period. Quick bread refers to the batter not needing time to rise like normal bread dough. But this quick bread also whips together in a flash. Sure, the baking takes about an hour and a half, but you certainly don’t need to be anywhere near the kitchen while that’s happening. The recipe calls for light brown sugar, but I used dark brown. I think it gave it a nice caramelly flavor to it. This is a dairy-free recipe, and if you want to keep it parve, use Earth Balance instead of butter for when you butter the pan. In a large bowl, whisk together the flour, sugar, baking powder, baking soda, spices and salt. Rub the brown sugar between your palms into the bowl, breaking up any lumps, then stir it in. Pour the wet ingredients over the dry, switch to a sturdy rubber spatula or wooden spoon and mix until blended – the batter will be very thick (really more like a dough than a batter) and not easily mixed, but persevere, it will soon come together. Stir in the mango, raisins and zest. Scrape the batter into the pan and smooth the top with a rubber spatula. Bake the bread for 1 ½ hours, or until it is golden brown and a think knife inserted into the center comes out clean. (If the bread looks as if it’s getting too brown as it bakes, cover it loosely with a foil tent.) Transfer the pan to a rack and cool for 5 minutes before running a knife around the sides of the pan and unmolding. Invert and cool to room temperature right side up on the rack. 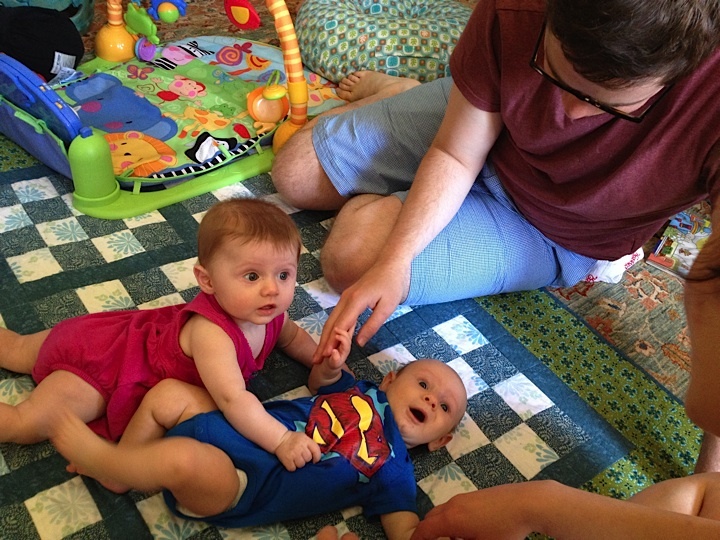 I’m doubting that Lilli will remember her first Fourth of July with her cousin Leo (son of Sylvie and Miriam, and now about 13 weeks old), but we certainly will. Each year we head up to York Harbor, Maine, to stay with Syl’s in-laws. 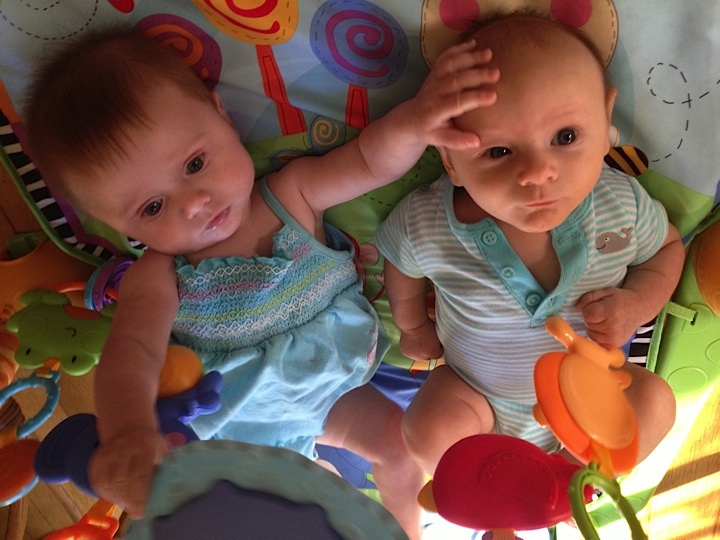 As you might expect, this year involved many cute photo ops with our babies. I like to bring a nice baked good whenever we head up (you’ll remember I sent them the date nut bread for Chanukah this year), but because Sylvie is deathly allergic to walnuts, and Miriam is allergic to all nuts, I went to work on a fruity dessert. I found my solution in a gift bag I received last week at a blogger lunch. I don’t usually go to such events, and rarely do they make their way onto my blog, but it was a great meal and I’m really happy with the product. Briefly, there is a family-run Hawaiian bakery called King’s Hawaiian. They bake a sweet bread, like one of those Portuguese breads — which, I read, is where the grandfather who started the company found his inspiration. They are a West-Coast brand and are just getting started on the East-Coast, so they invited some local bloggers to a meal at the Cambridge restaurant Catalyst. Chef William Kovel did all sorts of incredible things with the bread: white gazpacho sips with marcona almonds and King’s Hawaiian garlic chips; a Greek salad with grilled ahi tuna and olive crostini. He even did a little chef demo at the end with a white chocolate bread pudding with caramel sauce. It was the first time I was really away from Lilli for an afternoon of fun, and I got a little carried away with the guava mimosas. 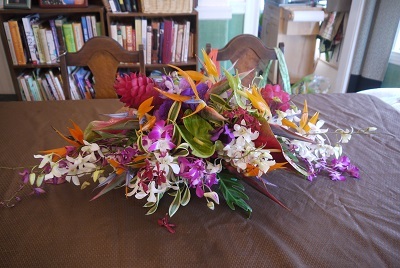 And so, of course, I took zero photos of my meal, and only took shots of the magnificent centerpieces. I was pretty psyched to win one as a door prize, and I actually brought it up to Maine. I also brought a loaf of the sweet round bread and used it to make this red, white and blue bread salad. It features strawberries from the CSA, and Syl gets special props for suggesting the addition of blueberries, making this a perfectly delicious patriotic dessert. Because our holiday barbecue featured meat and this bread is dairy, we had to eat our dessert first, before dinner. Unlike most of the recipes I share, this one takes some time; the bread needs to dry out overnight, so plan ahead. The night before you want to serve this, slice the round bread into one-inch cubes. 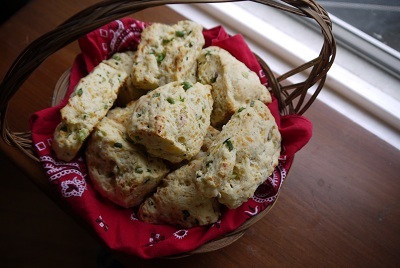 Set them aside on the counter overnight on a large baking pan. The next day, clean, hull and quarter your strawberries. Macerate them by putting them into a medium sized bowl and sprinkling a tablespoon of white sugar on them. While you do the other steps of this recipe, make sure to poke them every 10 minutes or so. In a small saucepan, melt the stick of butter with the brown sugar and pinch of kosher salt. After it melts, pour the sauce on top of the dried out bread. Toss as if you were making a salad, with some large serving spoons. Make sure everything gets coated. Put the pan in the oven for approximately 10 minutes. After 10 minutes, remove the pan, scraping all the bread and the pan’s sugar bits into a large bowl. 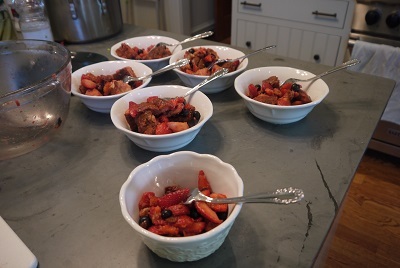 Now add the macerated strawberries and their juices to the bowl. Add the cup of blueberries. Toss everything real good. Maybe even use your hands to make sure this is done.